These notes were made during a four week trip though Mexico in 2005. These are just our food experiences and you may have a totally different experience depending on your budget, where you travel and where you eat. 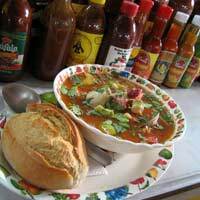 Typical meals - Everything in Mexico is spicy or served with some form of chili. Chili is served on fresh fruit and nuts, and occasionally even beer. We even found an orange flavoured boiled lolly with chili powder through. Most meals and snacks are served with a tomato, coriander, onion and/or capsicum salsa, as well as a hot green or red chili sauce (picante) and always with lime wedges. 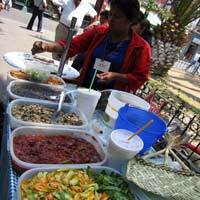 Dishes sometimes contain salads, but there is a very limited amount of fresh vegetables served with meals. Tortillas are much thinner in these parts of Central America, and are occasionally shaped differently than round. There is an amazing amount of ways to eat this form of bread as you will read below; it surely is a staple here. 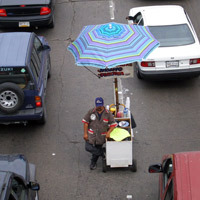 Tacos - Cheap and readily available anywhere. Usually served as a small soft corn tortilla, lightly warmed with the desired filling placed on top, either chicken, beef or beans with a little lettuce or cabbage and onions. Add chili sauce and lime, fold and eat. 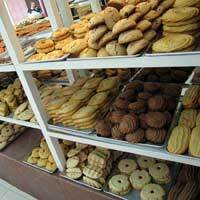 Other variations are rolled with filling and fried, or a folded tortilla fried like the ones back home. Nachos - well what a disappointment... Nachos are served much differently than in Australian Mexican restaurants. They are simply corn chips served with melted cheese or a cheese sauce, and occasionally with some refried beans. You can get more interesting nachos when you cross the border into the USA. Guacamole - This is a salsa of avocado, onion, coriander, sometimes tomato, and always chili. Much hotter than we get back in Australia! Served with many dishes as a side or with corn chips. Sopa de Azteca - a spicy tomato based soup containing either seafood or chicken, with crisp corn chips, topped with avocado slices and coriander and a touch of cream. Sopa de lima - a clear broth with a strong lime flavour which can have varying ingredients, like toasted tortillas, avocado, and chicken. Mole - This is a regional specialty of central Mexico. A spicy chocolate chili sauce (including 20 different spices) served with an array of meat, vegetable and rice dishes. It isn’t terribly sweet like chocolate, but would satisfy any chocoholic. Mexican style eggs (Or anything for that matter) - Eggs are scrambled and cooked with tomato, onion and capsicum and of course some spice. Molletes - non-sweet bread toasted and topped with refried beans and melted cheese, usually eaten at breakfast. 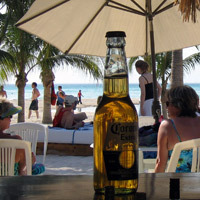 Burritos - Much more common in the North of Mexico. 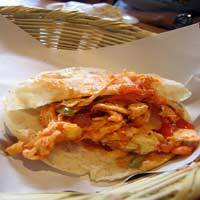 A large flour tortilla wrapped around an array of spicy fillings, and served with a sauce over the top. Also common is a breakfast burrito, with scrambled eggs and ham. Mexican McDonalds - Most of the menu was the same but Mexicanised names and with a few local alternatives like molletes served with a tomato/onion salsa, breakfast burritos, Mexican style omelette and McFiesta burger. Huaraches - A flat soft elongated tortilla served hot with refried beans as a base and topped with veges or meat, and fetta cheese, cream and chili sauce. Tostada - a small or large crispy tortilla served as a base with many different toppings, like refried beans, guacamole, chili sauce, salads. Easy to eat on the go. Gringa - a taco, soft tortilla folded and cooked stuffed with pork marinated in pineapple and spices, and cheese. 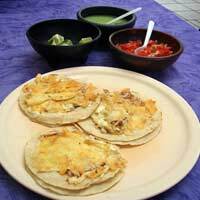 Chulapo - small round flat crispy tortillas, usually served a few on a plate, with a green or red chili spread, with a sprinkle of onion and chicken. This is splashed with lime juice so that when the tortillas are eaten they are semi soft. Taquillo - like a taco in other parts of Central America, rolled with filling and deep fried, served atop some lettuce, with a sprinkle of fetta cheese and cream. Tortas - finally a real bread roll that is not sweet! 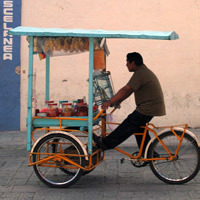 These are served in central Mexico, mainly in the north, filled with meat and salad, and some pickled vegetables. Nothing too exciting, but a change from all the sweet breads and tortilla meals. 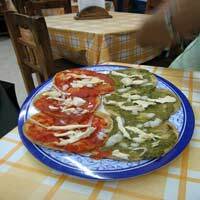 Gordita - A specialty of Zacatecas, a round tortilla filled with hot spicy fillings and warmed on a hot plate. A very popular take-away snack for locals, as it is cooked up in only a few minutes. Fajitas - This has been served in many different ways. Essentially it is meat, thinly sliced and stir fried with onion, capsicum and spices. This can be served on a plate with salad, veggies and rice, or can be served with warm tortillas and some accompaniments, like avocado, rice, lettuce, to be rolled up. Cactus - One vegetable that was used in meals was the common cactus plant. The oblong flat variety of leaves, are chopped, sliced and diced, stir-fried and added to meals, or sautéed with onion and tomato as a side dish. Unknown name - a tortilla sandwich, warm with avocado, thin spiced meat slice and spring onions, served with chili sauce. Bought in a market. Churros - Like a cinnamon donut only long, skinny and thinner. “play sport” on a coke ad! other non-food slogans included “beauty for health” on moisturiser ads, and “consult a doctor” on pharmaceutical ads.